This item detects an epitope within the C-terminal (CT) region of human Toso, also known as Fas Apoptotic Inhibitory Molecule 3 (FAIM3). Toso is expressed by lymphoid and haematopoietic cells and is up-regulated by T-cell activation. Toso expressing cells have increased resistance to Fas-, FADD-, and TNFalpha-induced apoptosis. Toso is membrane bound, and is thought to directly bind to FADD, disrupting DISC formation and thus inhibiting caspase-8 activation. Toso is a potential proto-oncogene, and could be a therapeutic target for use in the treatment of autoimmune diseases. Despite its predicted molecular weight, Toso often migrates at 60kDa in SDS PAGE. A 13 amino acid peptide from near the carboxy terminus of human Toso. Antisera to human Toso were raised by repeated immunisations of rabbits with highly purified antigen. Purified IgG prepared by affinity chromatography. Small volumes of anti-TOSO antibody vial(s) may occasionally become entrapped in the seal of the product vial during shipment and storage. If necessary, briefly centrifuge the vial on a tabletop centrifuge to dislodge any liquid in the container`s cap. Certain products may require to ship with dry ice and additional dry ice fee may apply. MBS221472 detects an epitope within the C-terminal (CT) region of human Toso, also known as Fas Apoptotic Inhibitory Molecule 3 (FAIM3). 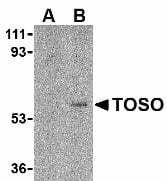 Toso is expressed by lymphoid and haematopoietic cells and is up-regulated by T-cell activation. Toso expressing cells have increased resistance to Fas-, FADD-, and TNFalpha-induced apoptosis. Toso is membrane bound, and is thought to directly bind to FADD, disrupting DISC formation and thus inhibiting caspase-8 activation. Toso is a potential proto-oncogene, and could be a therapeutic target for use in the treatment of autoimmune diseases. Despite its predicted molecular weight, Toso often migrates at 60kDa in SDS PAGE. Western Blot: This item detects a band of approximately 43kDa in human lung tissue lysate. NCBI/Uniprot data below describe general gene information for TOSO. It may not necessarily be applicable to this product. FAIM3: May play a role in the immune system processes. Protects cells from FAS-, TNF alpha- and FADD-induced apoptosis without increasing expression of the inhibitors of apoptosis BCL2 and BCLXL. Seems to activate an inhibitory pathway that prevents CASP8 activation following FAS stimulation, rather than blocking apoptotic signals downstream. May inhibit FAS-induced apoptosis by preventing CASP8 processing through CFLAR up-regulation. 2 isoforms of the human protein are produced by alternative splicing. 1. Overexpression of TOSO gene is associated with chronic lymphocytic leukemia.